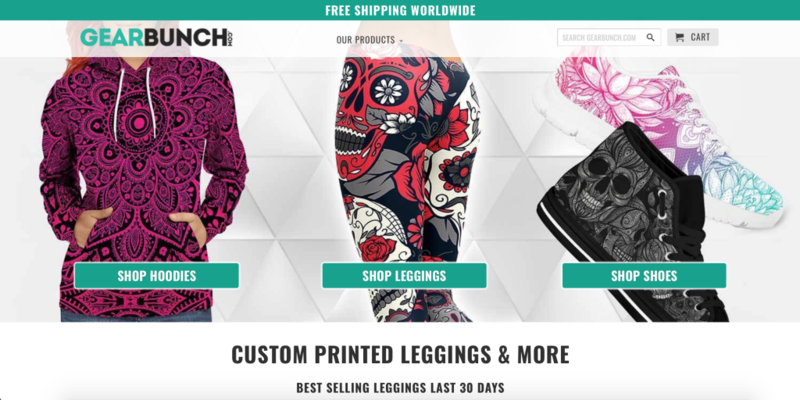 How Gearbunch Grew their Ecommerce Store to $5,000,000 in 1 Year! What’s the goal of your store? $1000 per month? $10,000? Your first six-figure year? Or are you trying to break the 7-figure level by year’s end? Whether just starting out and aiming for your first four-figure month or growing your store’s revenue by an extra digit the best way to learn is the same. Study those who have already achieved what you want to. Of course, that’s easier said than done. How many of us have access to 7-figure store owners? Not many, right? Fortunately for us all, Luuk Olde Bijvank from Gearbunch has put aside a little time to offer some insights on how he grew Gearbunch to $5,000,000 in revenue at the end of 2017. If you’re looking to grow your store, bookmark this page. The tips and tricks we’re about to share could be how you take your store to the next level. “We were doing pretty well selling t-shirts, but we weren’t the only ones. The market was quickly becoming saturated and we were finding it more difficult to stand out. So we started to look into other apparel. We knew the market and knew we could sell pretty much any clothing item. But we wanted to find the right product to stop from hitting the same problem we had with the t-shirts”. So basically, Luuk and Dan needed to find a gap in the market. A shortfall in the productofferings of other apparel brands. And it wasn’t long before they found it. “We looked into big sellers of apparel and noticed a growing trend for active gear. What we realized is these major players all only offered general items. What I mean is they designed the items to fit their brand. It means you just end up with, like Adidas/Nike/Under Armor’s summer/winter/fall/spring collection. Gearbunch put the customer first. Rather than trying to fit products to the brand, Gearbunch created customer avatars and created specific items to appeal to that demographic. “Take Irish Americans and how proud they are of their heritage. A real Irishman would shiver when they see a 4 leaf clover. The symbol of Ireland is a shamrock and NOT a clover. They’re proud of that shamrock! 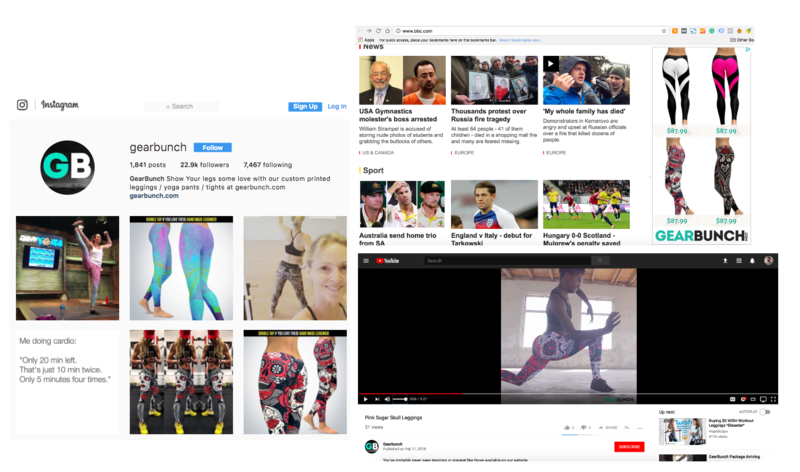 That’s how we research a niche, we find the one thing that a specific segment cannot ignore and use it to design an item specifically for that segment. By focusing on the shamrock, we were able to hit right at the hearts of Irish Americans and, as a result, get them to open their wallets”. By turning things on their head and putting the customer first, Gearbunch saw their stock literally fly off the shelves. In their first month of operation they were achieving $100,000 in revenue. After just one year, they’d hit nearly $5,000,000 in total sales. So What’s the Secret to Gearbunch’s Success? When I asked Luuk this question, he replied with an emphatic “Quality, quality, quality”. “We make sure that our customers not only fall in love with our brand, but also STAY in love. We’ve got customers who’ve spent over $10,000 on our items because they love the brand and product. 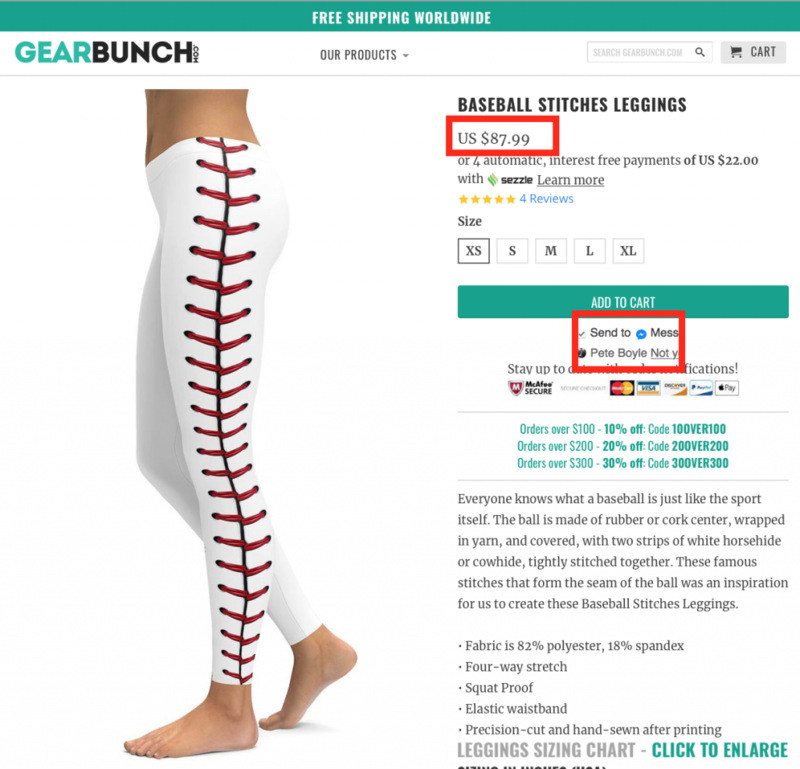 I’m pretty sure those guys must only wear our leggings! But seriously, our highest profit action is building a brand instead of hunting for single sales”. Growing a brand consumers love, one that treats them more like they’re family than a simple customer is one of the best ways to attract repeat business. But it’s something of a general piece of advice. I wanted to understand the exact tactics Luuk implemented, and so dug a little deeper on the tactics Gearbunch employed to help them achieve their brand building dreams. “Well, in the beginning we would do it all ourselves. Support, designing ads, running ad campaigns, managing the store, keeping on top of inventory, and we were burning out. The biggest move we made that helped us provide a better service was to take a step back from all this. To work on the business instead of in the business, this way we can spend more time building the brand instead of being the brand”. It’s an interesting definition, being vs growing your brand; but it’s one that really makes all the difference. By stepping back from the day to day actions, Luuk and his partner would have more time to spot the shortfalls of their strategy and devise fixes. “It’s all about the data. We test everything and let the data guide our strategy. Not only in the ad strategy and creative, but also on the store itself. We split test as many things as we can to see if we can up the conversion of our store. Most marketers don’t really do that, they talk about it, but never actually follow through. They pick things like prices based on their own profit margins and what they think it’s worth. But that’s something you need to test. We started with a minimum for what we needed to make a small profit, $49.99 and tested all the way from there up to $99.99. If we didn’t test, we’d still be charging $49.99. 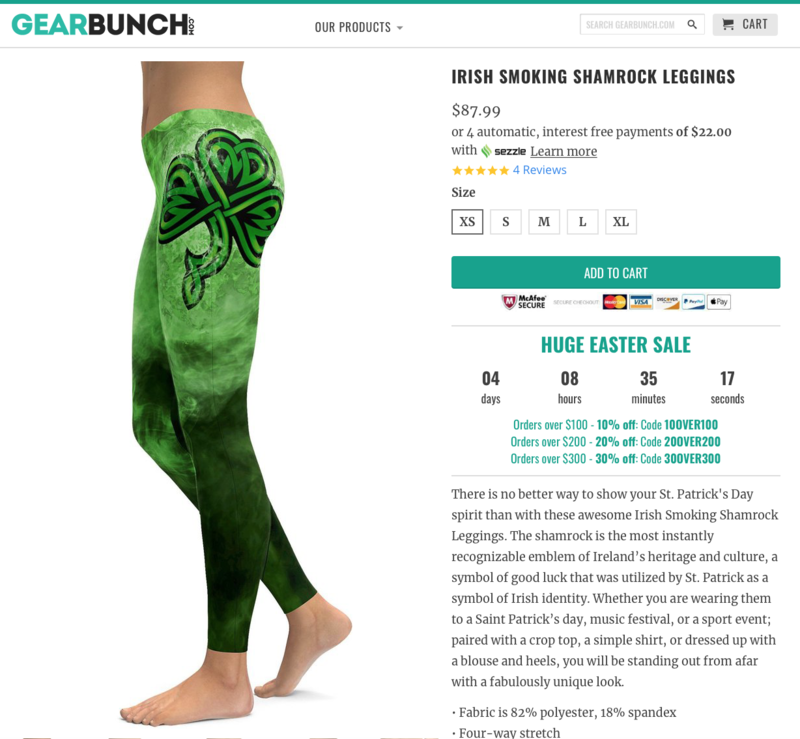 But the tests proved that the overall most profitable price was $87.99 which is what we now sell our leggings for. If we’d never tested, we’d have lost heaps of profit. Another action we took was installing Recart on the store. 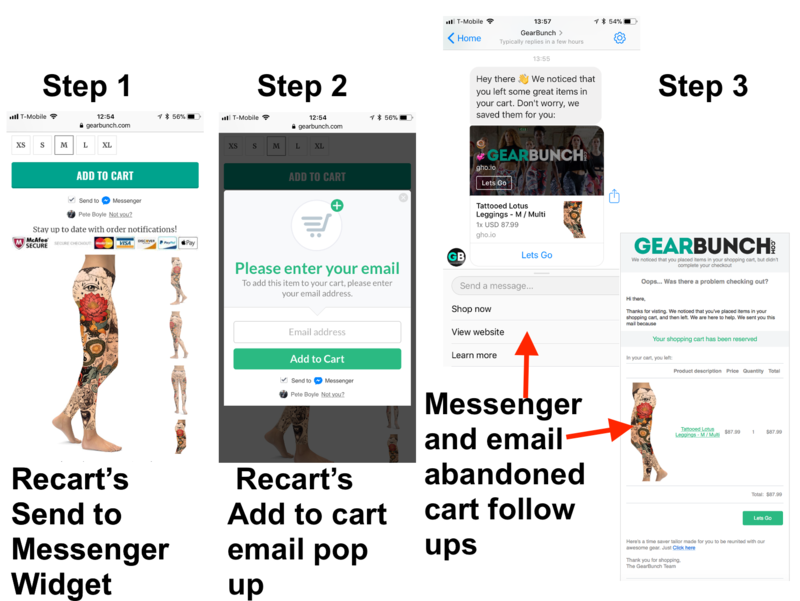 We haven’t implemented any of the manual actions like broadcasts, but have everything like cart abandonment on autopilot. Since September 2017 through till January 2018, Recart alone generated an extra $200,000 in revenue. I’m not just saying this because you’re from Recart, but it has seriously been one of the most profitable apps we’re using on our store”. So testing, Recart, data, and continual optimization are at the core of Gearbunch’s success. Thing is, to do these well, you have to commit a huge amount of time to optimization. A lot of ecommerce owners are only exploring ecommerce as a side hustle. I asked Luuk if there was a single action or tactic he would recommend above all others for those who don’t have the time. His response was more than a little surprising. “Never rely on one tactic. One of our big priorities is diversifying traffic in 2018 to other channels outside of FB like Instagram, Youtube, AdWords, and SEO. You need to test everything you can on every front. Does changing your layout, testing designs, exploring new niches, or anything else improve revenue? That’s the mentality you have to adopt. You have to constantly test beyond the usual areas of channel and CTR. A good example is when I created some neon leggings. When I was done, I thought ‘no-one is going to buy these’, but I’d put the time in and so it was worth a test, right? Well, they’re now one of our biggest sellers. What you think doesn’t matter. It matters what the data from numerous tests is telling you. At this point, Luuk’s covered most things an established store would need to know, but what about new stores or those thinking about getting started in ecommerce? “Beyond ensuring quality and exhaustive testing? Yeah. The biggest thing is to never quit. Quitters never win, and winners never quit. Keep trying new ideas, a failure is only a failure if it stops you from trying the next idea. Keep testing new things, and always look for the one thing no one else is doing. Zig where everyone else zags. For example, everyone is always focused on big Christmas promotions. We do too, but we also put more emphasis on Boxing Day promotions (the day after Christmas). That day is one of the biggest days for sales for Gearbunch of the year. Everyone stops advertising when the holiday is over, but people still want sales. We saw there was a gap so we said ‘hey, what if we go big just after everyone else has stopped?’ and it worked. Same goes for New Year’s Day. And finally, I asked what Luuk see’s other stores making. What are the biggest problems and errors he sees when shopping that stop other stores from breaking six, seven, or even eight figures in revenue? “Most often I see people only selling a certain product. They try to find the product first, scale it until it dies, and then do the process all over again. Nothing wrong with this tactic, but it has a very short lifespan and there’s no compounding gains. If, instead of scaling a single product, owners’ focused on building a brand, they could sell more than a single product to customers which would increase AoV and lifetime value. Basically, people are too focused on the front end. They’re focused only on that initial sale. At Gearbunch, I’d happily break even on that initial sale because I know how much we can make after than sale. Our returning customer rate is 26%, and most of those guys buy more than 10 items from us over a couple of months. That’s where the real money is. This isn’t some hypothetical breakdown of how to increase your store’s revenue. Luuk and Dan are sharing real-life tactics they’ve used to grow a real store to $5,000,000 in just over a year. If you want to check out the Gearbunch team, you can find their website right here, and here’s their Instagram and Facebook pages.